I don't know about all of you, but if I'm ever going to be caught off guard by a social event or expectation, it's going to happen in November or December. Between thoughts of, "That party is this week?" and, "I thought you were getting the hostess gift," I find myself scrambling at least once a week from now until after New Year's. And yes, I do recognize the irony of working part-time as an executive functioning coach while I struggle with time management and organization myself. But anyway, whether you're fumbling to figure out what to serve as an appetizer for Thanksgiving, bring to a friend's holiday housewarming, give to your coworker for a Secret Santa gift, or present to that tough-to-shop-for relative, I've got the solution: A jar of crunchy, salty, smoky, spicy nuts and seeds from Oh She Glows. The recipe is dairy-free and vegan, and it can be made gluten-free by swapping out the soy sauce for coconut aminos. And it takes almost no time to put together! Preheat the oven to 325° F. Line a large rimmed baking sheet with non-stick foil or parchment paper. 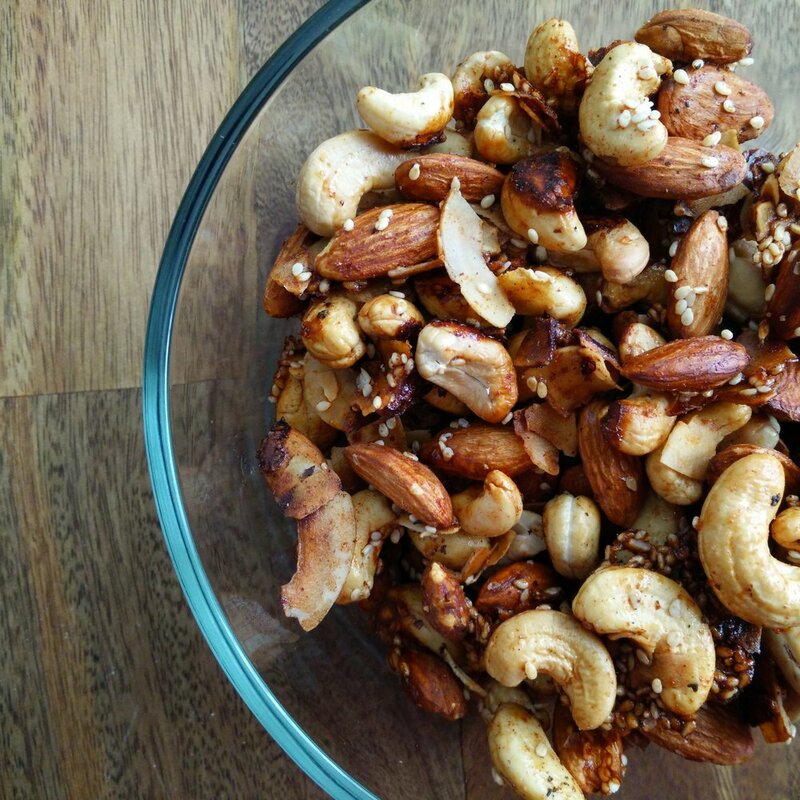 Mix the cashews, almonds, coconut, and sesame seeds in a medium bowl and set aside. In a small bowl (or even a mug), mix the remaining ingredients with a fork or small whisk. Pour the wet ingredients over the nuts mixture and toss to coat evenly. Spread the mixture out on the baking sheet in a thin layer. Bake for 10 minutes; stir, and then bake for another 10 minutes, or until the coconut flakes are golden brown. Allow to cool; store in an airtight container (if it makes it that far). I made a few tiny changes to the original recipe; I increased the cashews and almonds and decreased the liquid smoke slightly. The original author recommended running the range fan and opening a window, so that made me a little leery of using the full liquid smoke amount. Even with the smaller amount, it was still pleasantly smoky, especially since I used chipotle hot sauce in addition to the smoked paprika. By the way, if you're on the fence about the coconut, don't skip it! Yes, it's unusual, but in the oven, it becomes crispy and golden, and it lends a beautiful flavor without being too assertive. I wouldn't say it tastes coconut-y at all, really! Thanks to a Groupon offer, I've been spending a significant chunk of my summer vacation at the gym, trying to whittle away a significant chunk of myself. (No, this isn't a guest post; it's really me!) In addition to working out more often, I've also been trying to eat healthier, especially by avoiding mindless eating. Of course, it's hard to avoid snacks when I'm home alone for most of the day, but I'm finding that if I keep healthy snacks on hand, I can give in to my cravings without getting too off-track. Desserts have always been my weakness. I find myself craving sweet things when I'm stressed, bored, or tired. For the most part, I've purged the apartment of the things that I give in to the easiest; I don't keep ice cream at home, and I buy Bryan desserts that he loves but I don't (banana twin pops... yuck). A few weeks ago, I found an Allrecipes version of protein balls and decided to give them a try. They seemed sweet enough to be satisfying but healthy enough to be acceptable. I made mine into squares instead of balls, partly because I wanted them to resemble fudge, but mainly because I didn't feel like getting my hands messy! Mash all the ingredients together in a medium bowl. When it's all blended, it should be soft and smooth and feel a little thicker than buttercream icing. Line a square baking pan with wax paper or non-stick foil. Spread the peanut butter mixture evenly across the pan and cover with plastic wrap; press down lightly to squeeze out any air bubbles. Stick the pan in the freezer for at least two hours. Remove the pan from the freezer and cut the "fudge" into 16 squares. Transfer the squares to an airtight container or bag, separating layers with foil or wax paper. Keep the squares in the freezer until you're ready to eat them. It's really a very simple recipe. To be honest, the toughest part was cutting them into squares after they were frozen! I think the thinner they are, the easier they are to cut. I have a bag of them in the freezer now, and I've been eating one at a time as I feel like it. I've eaten them right out of the freezer and also waited for them to thaw, and I definitely like them better frozen. When they thaw, they get so soft and gooey that they're difficult to handle. Do they taste just like fudge? Ofcoursenot. But they are sweet, creamy, and chocolatey, so they're a pretty good substitute. According to Sparkpeople's recipe calculator, each square has 112 calories, 8.5 grams of fat, 6 grams of carbs, and 5 grams of protein, which is way better than you'd do with a cookie or candy bar. It's the first weekend of October and also the second day of Vegan MoFo. What better way to celebrate than with cookies? Earlier this week, I made a batch of moist, dense pumpkin cookies from the Post-Punk Kitchen (best blog name ever). Bryan and I enjoyed them, and they impressed my new vegan friend Lisa, which seems like a good sign to me. Mix all the ingredients together in a large bowl, using a spoonula or wooden spoon. Chill the dough in the fridge for one hour. Drop the dough by spoonfuls onto a cookie sheet lined with a Silpat or parchment paper. Sprinkle with coarse sugar if using. Bake cookies 12-15 minutes. Allow to cool on sheet for a few minutes before transferring to a rack to cool completely. Is that the longest list of ingredients I've published thus far? I'm thinking it must be. It's a lot of ingredients, but it's really not a lot of work at all. The original recipe called for 1/2 cup vegetable shortening, but I didn't have any and I'm also not thrilled by the idea of it. Instead, I replaced that ingredient with a combination of applesauce and canola oil. If you've ever baked with applesauce, you know it has a tendency to make your baked goods come out really dense. It also makes them moist, which is great! This cookie was already dense because of the pumpkin, but the applesauce made it even more so. Don't make this recipe expecting the fluffy or crispy texture of a traditional cookie; what you end up with feels more like a muffin than a cookie. They also don't spread out the way traditional cookies do. The flavor, however, is unbelievable. I highly recommend throwing in the candied ginger if you have it. All the spices in this recipe work so well together to capture the essence of autumn. With flavors this enticing, who the hell needs eggs? One quick note: Some vegans avoid regular sugar because of the way it's processed. If you're one of those vegans, make sure you substitute an appropriate sweetener. And if you do, please let me know! I'd love to know what you used instead.